HIGHLIGHTS: Sham Valley Tour, Pangong Lake, Jeep Safari to Nubra Valley via World’s highest motorable road – Khardungla. Arrival Leh, AIR representative will meet, greet, assist and transfer you to Hotel in Leh. Rest of the day free to acclimatize to the high altitude of Ladakh. In the evening take a walk to the local bazaar in Leh. Overnight at Hotel in Leh. Morning after breakfast drive to Alchi. Enroute visit Magnetic Hill, Gurudwara Patthar Sahib, Confluence of Zanskar and Indus river. 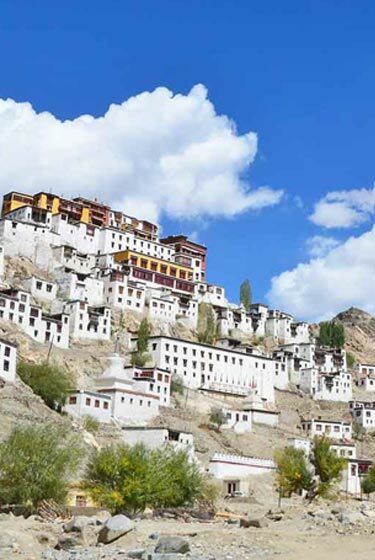 Visit Alchi Monastery and drive back to Leh. Just before reaching Leh visit Ladakh Hall of fame. Arrive hotel in Leh for dinner and overnight. MAGNETIC HILL : Defying the Law of gravity. This place is close to the Gurdwara Shri Patthar Sahib. It has been noticed that when a vehicle is parked on neutral gear on this metallic road the vehicle slides up-hill that’s the Believe it or not of Ladakh! GURDWARA SHRI PATTHAR SAHIB: The Shrine known as Gurdwara Patthar sahib is situated about 25 kms. Short of Leh town on the Leh-Srinagar road. Built in the everlasting memory of Shri Guru Nanak Deve Ji the great prophet who sanctified the place by his sacred visit during the year 1517 while on his second missionary tour (2nd Udassi 1515-1518). The Guru reached here via Nepal, Sikkim, Tibet Yarkand and Leh after having spiritual discourses with the sidhas at Mount Sumer (Central Himalayas). On the hill features across the road, there used to live a wicked demon that terrorized the people of the area. Their miseries multiplied day by day. As their miseries became unbearable they prayed for divine help. It is said that the Great Guru heard their woes and came to their rescue. The Guru settled down on the bank of the river flowing nearby. The people sought for help and the Guru blessed the people and became very popular in the area. The locals called him as Nanak Lama. The Demon got enraged and started making plans to kill Guru Nanak. One morning, when the Guru was sitting in meditation, he rolled down a big boulder from the hilltop with the aim of killing the Guru. But on the very touch of Guru’s body, the solid rock melted like wax and Guru’s back got embedded on it like a cushion. The Guru kept on sitting in meditation undisturbed. Thinking that the Guru must have been killed, the demon came down but was taken aback on seeing the Guru in meditation, undisturbed. With a rage of anger he tried to push the rock with his right foot but the rock had already became like wax his foot also got embedded into it. On this , he realized his folly and powerlessness as compared to the spiritual power of the Great Guru. He fell on the feet of Guru and humbly prayed to be pardoned. The Guru advised him to get rid of his wickedness and lead the life of a nobel person, in the service of humanity. This changed the life style of demon and he started serving the people. The Guru there after continued his Holy journey towards Srinagar and Kashmir via Kargil. The boulder having imprint of the Guru’s back is lying in the Gurdwara to this day. CONFLUENCE OF THE ZANSKAR & INDUS : On way to Sham Valley before Nimu village one can have this magnificent view of two rivers in wed-lock! In seasons they have different colors and flow and wildness. ALCHI GOMPA: 70 Kms from Leh, on the banks of the Indus, is the Alchi Gompa dating a thousand years back. One of its walls features thousands of miniature sized pictures of the Buddha. Three large sized images made of clay and painted brightly are its focal attractions. No longer an active religious center, it is looked after by monks from the Liker monastery. This is the only monastery amongst 34 monasteries, which is not located on a hilltop. Morning after breakfast drive to to Pangong Lake on the Indo China border. Evening back to hotel in Leh for dinner and overnight. 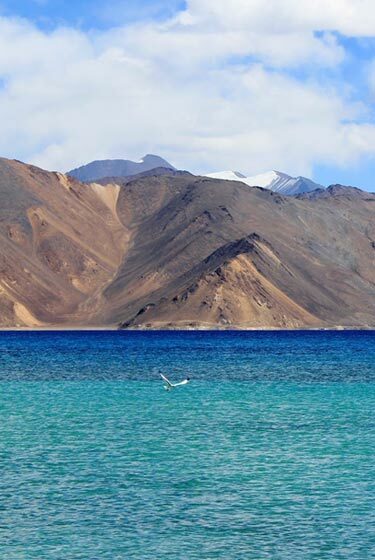 THE PANGONG LAKE : This route takes the visitor past the picturesque villages of Shey and Thikse, and turns off the Indus valley by the side valley of Chemrey and Sakti. The Ladakh range is crossed by the Chang-la (18,000 feet / 5,475 M) which despite its great elevation is one of the easier passes, remaining open for much of the year even in winter, apart from periods of actual snowfall. Tangse, just beyond the foot of the pass, has an ancient temple. 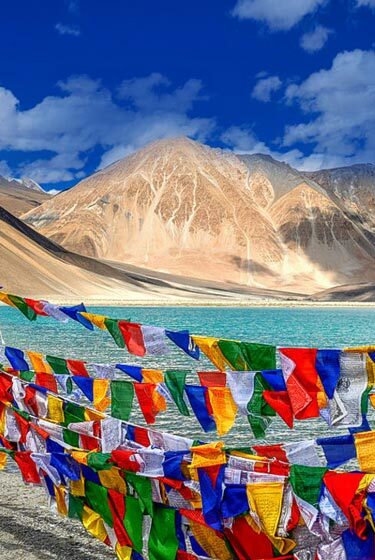 But the main attraction of this circuit is the Pangong Lake, situated at 14,000 feet (4,267 M). A long narrow basin of inland drainage, hardly six to seven kilometers at its widest point to which foreigners are permitted, is only some seven km along the southern shore from the head of the lake, but it affords spectacular views of the mountains of the Changchenmo range to the north, their reflection shimmering in the ever-changing blues and greens of the lakes brackish water. Above Spangmik are the glacier and snow-capped peaks of the Pangong range. Early morning proceed to Nubra Valley via the World Highest Motorable road (5602 Mts) Khardungla pass. Arrive Nubra and proceed for a visit to the White Sand Dunes at Hunder. You can enjoy the camel ride (On Own). Later if time permits visit Hunder and Diskit monasteries after complete sightseeing drive back to Leh. Over night hotel at Leh. KHARDUNGLA PASS: The road journey to Nubra valley leads through Khardung La pass (The highest Motorable road in the world) 18,390 ft. around 39 Kms. Away from Leh. There are two checkpoints on the both sides of the pass. 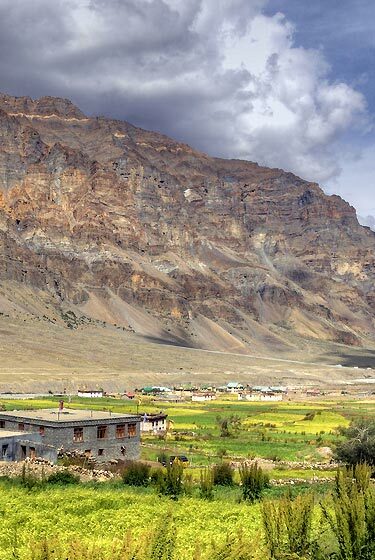 Khardong is the first village of Nubra valley at higher altitude than Deskit and other villages. DESKIT VILLAGE: Deskit is the main village of headquarter of Nubra valley, which has a small market consisting of a row of shops and about 500 years old Gompa on the hilltop. Spectacular view of the valley can be seen form the monastery. DESKIT GOMPA: Deskit Gompa was founded by Lama Sherab Zangpo of Stod in about 1420 AD during the reign of King Dragspa. About 100 monks are residing in the Gompa, which is a branch of Thikse Monastery. The monastic festival called Gustor takes place on 20th and 21st days of the 12th month of Tibetan calendar. HUNDAR VILLAGE: Hundar is a beautiful village to stay with lot of trees and you will really enjoy your stay at Hundar. It has a small monastery and ruined fort above the village. The walk or Camel Safari (Double Hump bacterian camels) from Hundar to Deskit, through sand dunes for two hours is wonderful (on own). 04 nights stay at specified hotels in Leh. 3. Transportation by 01 NAC Quails / Scorpio/ Travera /safari /Xylo (as per availability) for arrival / departure transfers, sightseeing as per the itinerary. 4. Assistance at the airport while arriving and departing. Any monastery entrance fees, Any Joy ride or rafting. Tips, laundry, liquors, wines, mineral water, telephone charges, camera fee and items of personal nature. Transportation is not on disposal basis. It is strictly as per the programme, any extra running will be charges extra. Any other item not mentioned in the cost includes section. · Within 14 Days there will be 01 night retention. · Below 07 days No refund for cancellation or after starting of the tour. All the arrangements for the tour are preplanned and prepaid. In case of not completion of the tour due to any reason whatsoever there will not be any refund for any unutilized services. Any extra expense due any alteration has to be paid extra. · Children below 5 years of age are allowed to stay free with parents without extra bed. · Children between 5 – 12 years have to take an extra bed at the prescribed rate. 02nd child between 5 – 12 years sharing parent’s bed have to pay extra for Meals only.